Law and Justice (Prawo i Sprawiedliwość) (PiS) is a Polish central-right political party, established in 2001, by the Kaczyński brothers: Lech, the former justice minister and the current mayor of the capital, Warsaw, and Jarosław, who is the President of the party. A large proportion of party members came from various small member parties of the now defunct Akcja Wyborcza Solidarnosc coalition. In the 2001 elections PiS gained 44 (of 460) seats in the lower chamber of the Polish Parlaiment (Sejm) with 9.5% votes. In the 2004 European Parliamentry elections, the party came in third, receiving 13% of votes and 7 of 54 seats reserved for Poland in the European Parliament, as part of the Union for a Europe of Nations. For most of 2004 and 2005, opinion polls put PiS at the second or third position, with the more moderately conservative Citizens Platform (Platforma Obywatelska) being in the lead. For a few years, a coalition of PO and PiS has been believed to be most likely to form the government after the upcoming parliamentary election. 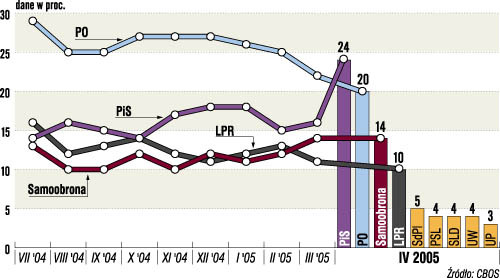 In March 2005, PiS unexpectedly overtook its rival PO. A recent poll shows them taking the lead with 24%, gaining 8% percentage points, while PO drops slightly to 20%  (http://bi.gazeta.pl/im/5/2657/m2657895.jpg). PiS demands better public safety and a reform of the legal system to fight crime more effectively - including advocacy of the death penalty. Its rhetoric is particular aggressive about fighting corruption. The party supported Poland's European Union accession, but projects a more Eurosceptic and more populist overall image than PO does. The party's public profile is dominated by two popular politicians, the brothers Lech and Jaroslaw Kaczynski. The PiS MEPs belong to the Union for a Europe of Nations caucus. This page was last modified 21:44, 28 May 2005. This page has been accessed 4236 times.